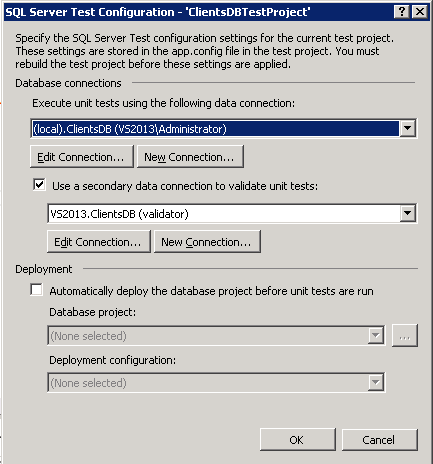 SSDT Unit Test Connection For Validation. Really? 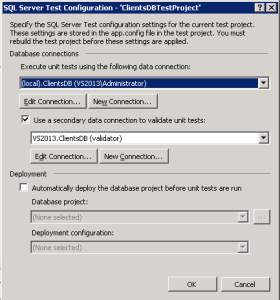 When you create database unit test project, you need to setup connections to your database. I always use only one connection to run the code and test conditions. But I was curious what is the second connection for? Where does that validation occur? Here are the results of my checks. As you see, only test execution phase uses connection 1 (“execution”), whereas all the other phases use connection 2 (“validation”) if you use 2 connections. If you use only one connection, so all the steps will be run under this unique username.